The Bulldog features a durable maintenance-free urethane wheel which eliminates worries about air pressure loss like other models. Ball chute allows for real 9" baseballs as well as 11" and 12" softballs. 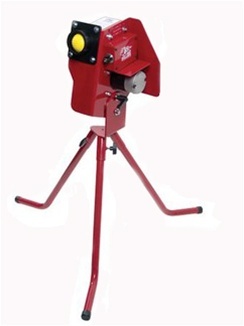 1/4" 10-gauge steel motor housing with a 1/4 HP D.C. motor easily and reliably pitches balls up to 60 mph.